Growing up in Wisconsin, large family gatherings occurred quite often, pretty much monthly. And that could mean 20-30 people in one place, which is obviously a lot of mouths to feed. Typically these gatherings were potluck-style, so everyone brought their dish to share – and when there was a stand-out recipe, you were asked to bring it again and again. That’s how I was introduced to the delectable tortilla rollups appetizer. 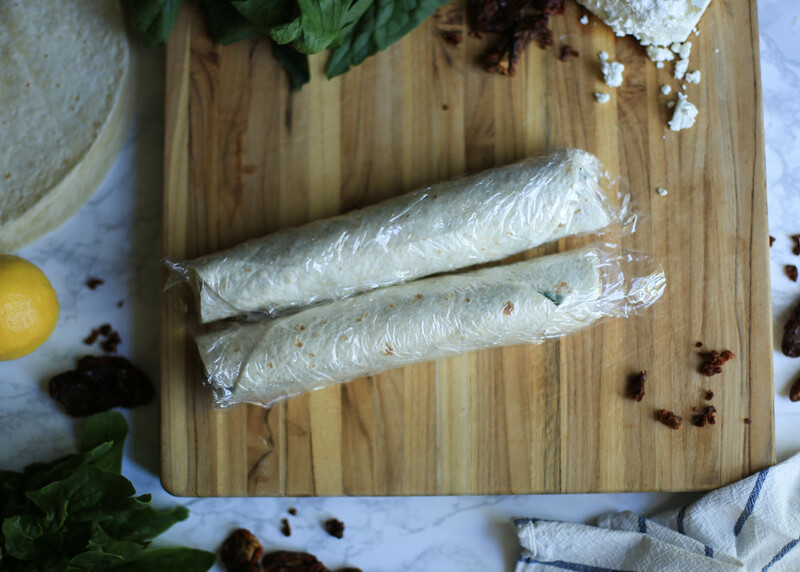 My stepmom has made tortilla rollups for many a family get-together, and every bridal and baby shower I’ve hosted. (Which has been quite a few.) They are always a huge hit. Now, with Memorial Day coming up, we are at the brink of summer outings, potlucks, and grilling season. I’m sure you’ve noticed magazines or commercials trying to sell you all that outdoor furniture. No? Just me? I think my neighbor would get angry if I tried to put an outdoor dining set on their deck (since I don’t have my own deck), but probably worth the try, am I right?? 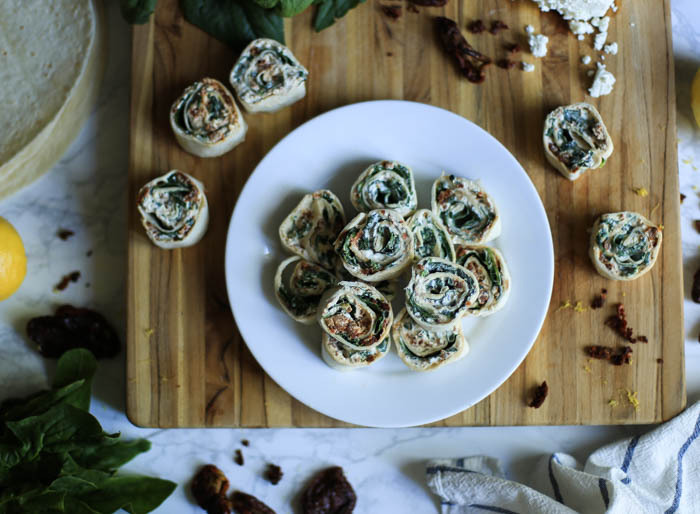 This is a lightened-up version of tortilla rollups, substituting feta and Greek yogurt for half of the usual cream cheese. And what goes splendidly with feta? 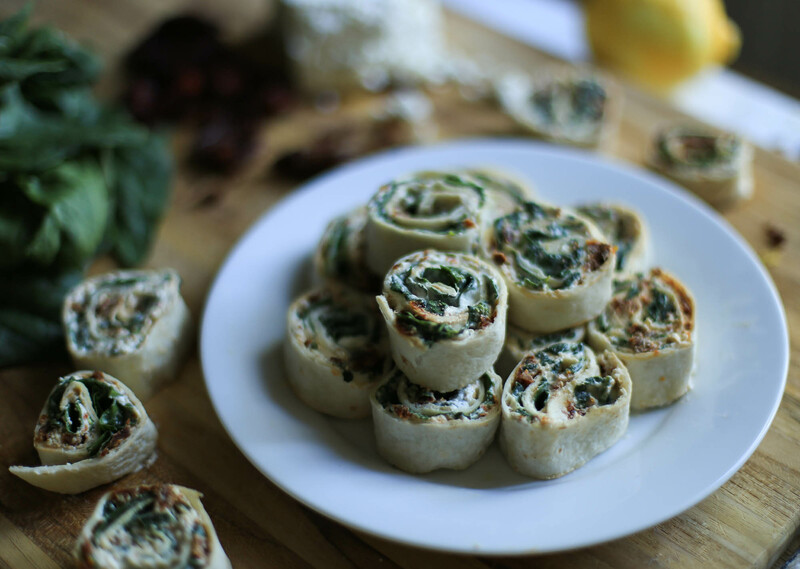 Tart sun-dried tomatoes, and spinach for a little texture. 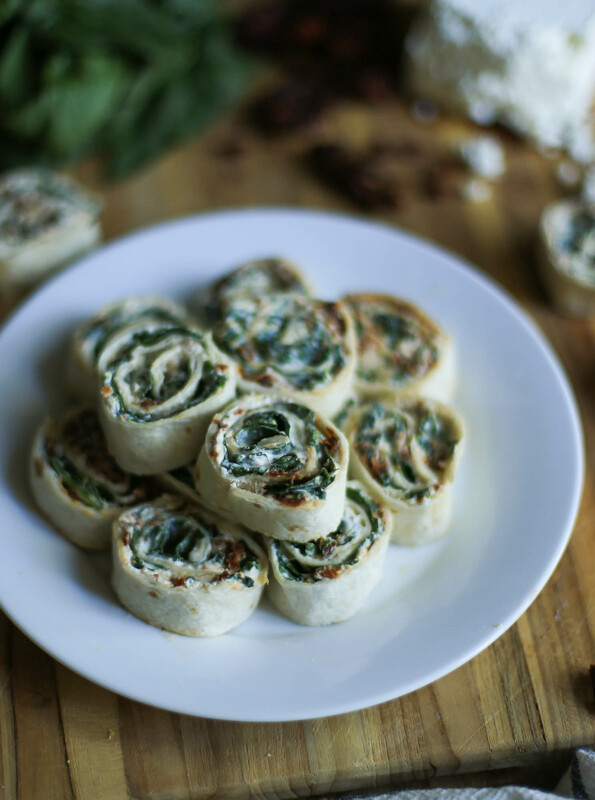 The combo makes a savory, creamy pinwheel that happens to be the perfect size for finger food. 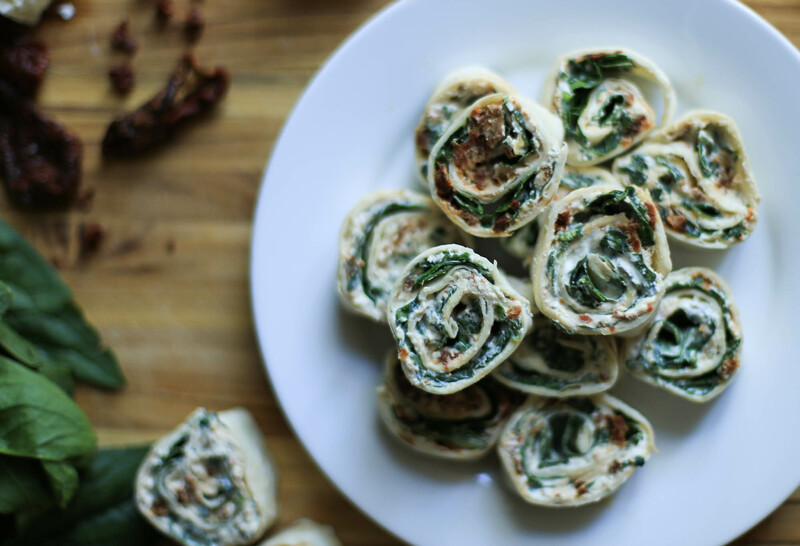 Even better, there is no cooking required to make the rollups. Any temp above 90 degrees and the oven isn’t going on, folks. So some would say this recipe is…no sweat. 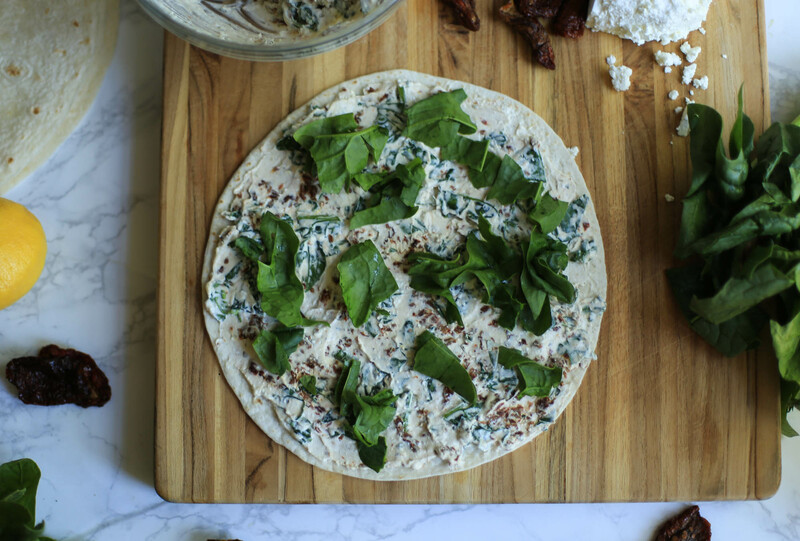 Mix some stuff together, spread it on a tortilla, and roll it up – true to the name. Roll’em tight. 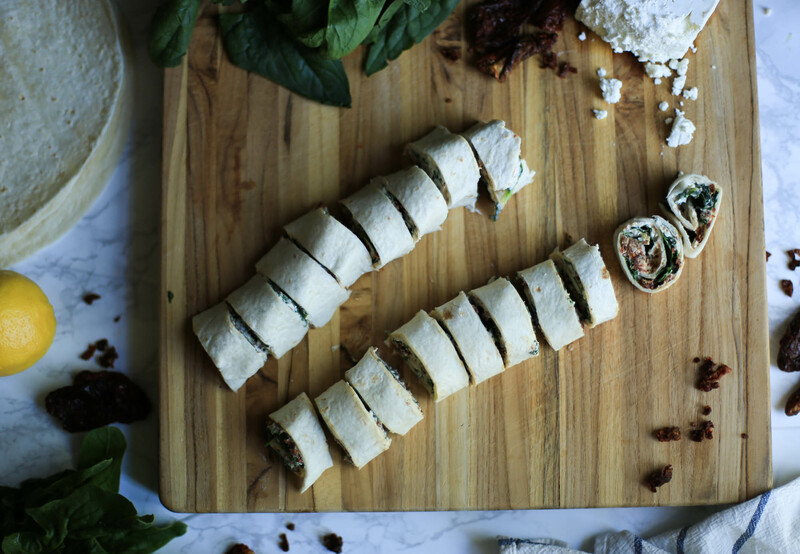 Wrap some plastic wrap around the rolls, and store in the fridge for at least an hour (up to overnight), so that the rollups can set. Cut into slices right before serving. The recipe is easily doubled in case you have to make a large batch. For example, if you have 18 first cousins attending the gathering. 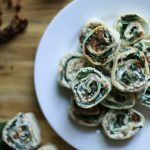 The flavorful bite-size tortilla pinwheels are one appetizer recipe that don’t require a lot of time or effort to make. Not to mention the fact that they are portable and can be served at room temperature. I believe that checks all the boxes for awesome party food! You can please the whole crowd/family. Deciding whether or not to share is another matter. 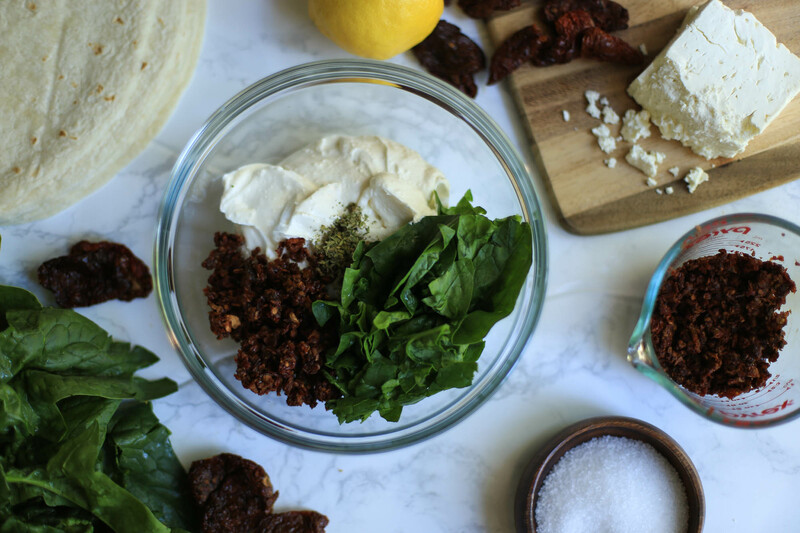 Place the sun-dried tomatoes in a food processor and blend for about one minute to break down into small pieces. Transfer to a bowl and set aside. Place the cream cheese, feta, and Greek yogurt in the food processor and blend for 1-2 minutes until the feta is completely blended and the mixture is creamy. Add in the oregano, garlic powder, pepper, and honey. Pulse to mix together. Use a spatula to scoop the cream cheese mixture out into a large bowl. Add 1/3 cup of the chopped sun-dried tomatoes (there will be some extra sun-dried tomatoes left over). 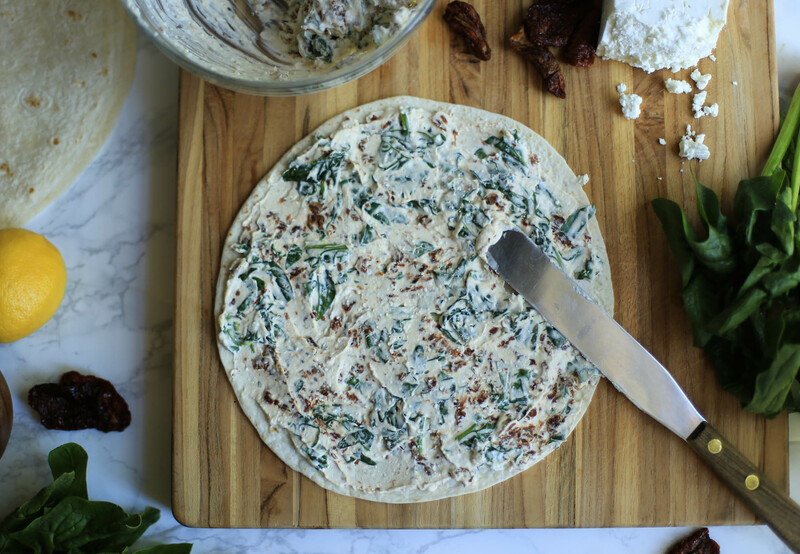 Add most of the spinach, reserving about 1/2 cup, and stir the ingredients together until the spinach and sun-dried tomatoes are fully incorporated. Divide the cream cheese mixture between two large tortillas. Spread out in an even layer to the ends of the tortillas. Top with the remaining spinach. Tightly roll up the tortillas. Wrap in plastic wrap and place in the refrigerator for at least one hour (up to overnight) to set. When ready to serve, slice the tortillas into 1/2-inch strips. Assemble on a plate and serve. This recipe can be easily doubled for a large crowd!